1.) To keep things simple, pack 3-4 outfits per person. This works out great because we have a washer and dryer in our cabin, which really cuts down on the amount of clothes we need to pack. If you don't have the option or time to do laundry while you're on the road, pack outfits, not just random tees and shorts/pants. To be honest, even though I've packed us up for numerous getaways, I still just started throwing things our suitcases. The suitcases instantly became too full. Lauren suggested only 3 outfits per person and that made the light bulb go off in my head. Due to our adventures on the road, I have to pack more than 3 outfits per person, BUT I can pair each shirt up with shorts, instead of a random tee and random pair of shorts here and there. Also, be sure to have back up clothes easily accessible for those "uh oh" moments. Like when a kid accidently pees in their car seat or spills an entire bottle of water all over them and the kids next to them. Those things DO happen. Also, before packing, check the weather of where you'll be. We noticed quite a bit of rain in the forecast in mountains and packed rain coats (not originally on our list of things to bring with us). Thank goodness we had them because it saved us from getting drenched in the downpour on our last night in the Smokies. 2.) Pack a cooler and grocery sacks snacks and drinks. This cuts down on the amount of stops and money spent as gas stations. 3.) Make sure you have proper identification for each person. We bring copies of birth certificates, driver's licenses, insurance cards, at least 1 bill (usually a phone or internet bill) that has our current address on it), and all season passes that we have. All of the id's can come in handy in case there's an injury and you need to go to a hospital or clinic in a different state (or if another emergency were to happen). We currently hold season passes to our local zoo and science center (and our local amusement park, Adventureland). We always carry the cards with us because you never know where you can get a discount to various restaurants, educational stores, and other zoos and museums around the country. 4.) Sirius XM radio. Lifesaver through dead spots in stations. Not really a packing tip, but more of a preparing tip. 5.) Use all sizes of suitcases. This trip we tried something different and it really worked out well for us. We used 1 large suit case and 2 smaller (think carry on size) suit cases for our clothes. We were going to use 2 large suit cases, but we realized we were saving space by using 1 large and 2 smaller sized. We also had the kids pack their kid suit cases full of toys and books. These are the perfect size to fit under their seats or right under their feet while we travel. 6.) Pack garbage bags or sacks for dirty clothes. Even when we're gone for two days, we seem to accumulate a ridiculous amount of dirty laundry. One of my pet peeves is having dirty clothes near clean clothes (so gross!). In the past, I've either brought a separate suitcase to hold all of our dirty clothes or garbage bags to put our dirty laundry in. A friend of mine buys large zip lock bags for each piece of clothing. That way when you're done wearing each item, it goes in it's own bag and can be kept sealed until washing. That's a bit too much work for me, but it works great for her. I go the garbage bag route. 7.) Limit the number of shoes per person. Shoes can take up a lot of room in suitcases. Whenever we road trip it, we tend to bring as many shoes as we *think* we may need (spoiler: we don't ever need as many as we think) because we can set them inside the van. This time around, we've limited it to 3 pairs per person: tennis shoes, Keens, and our hiking boots. That's still 15 shoes in the minivan, but we're lucky and have stow and go, which means the floor under us is space that we'll use. 8.) Make lists. Make lists of the things you need for your trip, lists of things you need to bring, lists of things to pack. Six months ago we began a list of things we needed to buy for our trip (in our case a lot of new and durable hiking shoes and clothes). Two weeks out from our trip I made a list of things we needed to bring (since we rented a cabin, we needed plates, utensils, etc.). A few days before I made a list of everything that needed packed (which clothing items everyone needed, how many shorts/shirts/pants, etc.). Packing still takes a while but these things at least made it easier and cut down on the amount of stuff we had to buy on the road. 9.) Keep things such as sunscreen, bug spray, sunglasses, medicines, etc. within easy access; meaning, don't bury the things you'll be using quite a bit into the very bottom bag. I kept these things and a few other neccessaties (baby wipes, tissues, contact solution) easily at hand in my oversize purse. I've been known to pack an extra "front seat bag" that I keep tucked under my seat or right next to me at my feet with the important items. 10.) Go with items to make your life on the road simpler. For example, I bought a small bag (nearly the same price as a large bag) of All laundry pods. 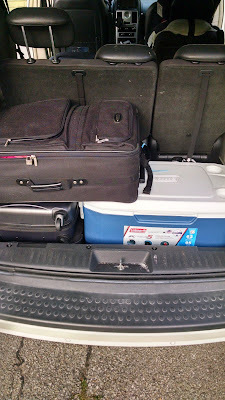 The small bag had just enough for our trip and took up waayyy less room than my usual large bottle of laundry detergent. 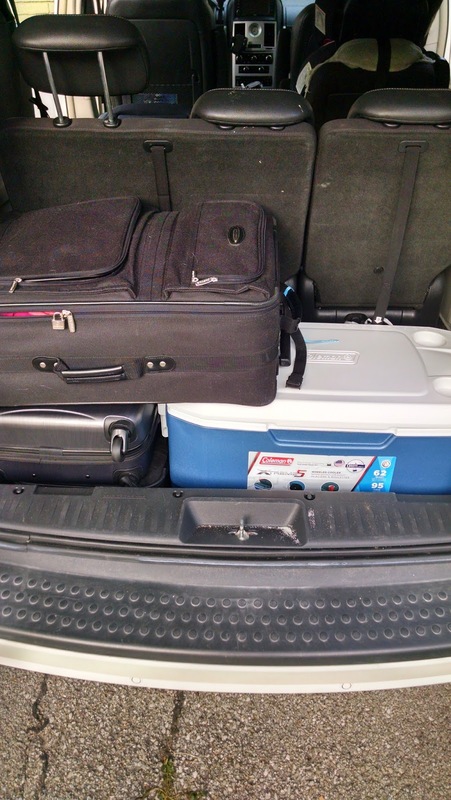 Travel size items and smaller toiletries all take up less room. For our 9 day adventure, I really cut down on our large toiletry items and packed small because we had so much we needed to bring.